A collection of luxurious cufflinks for men, each design beautifully crafted and available with full personalisation. A pair of fingerprint cufflinks crafted from Industrial grade Titanium, created to order and fully personalised with laser engraved fingerprints - completed with a mirror polish and inclusive of luxury packaging. A pair of bespoke Titanium cufflinks, laser engraved with your custom fingerprints, beautifully presented in luxury packaging. Each pair of cufflinks carries a unique reminder of someone special, making each pair truly unique and a perfect gift to wear and to treasure. A unique pair of compass engraved Titanium cufflinks, fully personalised to include your own co-ordinates, captured within a truly individual design. 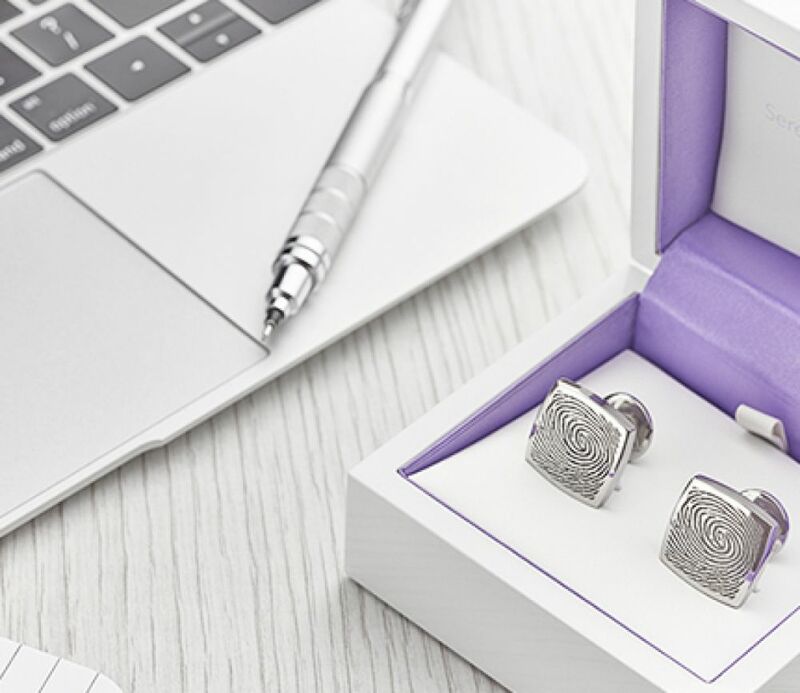 Capture a heartbeat across a perfect precision crafted and engraved pair of personalised Titanium cufflinks. Solid Titanium construction. Precision engineered. Bespoke engraving included with assistance and equipment for capturing an actual heartbeat. 3 weeks delivery. Beautifully presented with gift box and available with International delivery to many countries from our UK showroom. Round Table cufflinks, laser engraved with the Round Table emblem, the rondel, satin finished and beautifully boxed. Unique crab claw cufflinks, created in solid Silver. These unusual cufflinks include a contrasting yellow gold plated finish and free moving backs for easy insertion into the cuff. Classic and simple, these perfectly crafted Titanium cufflinks are a one part design, built from industrial strength Titanium, available with optional engraving. Lightweight with a substantial yet luxurious feel. Luxury round matte Titanium cufflinks, precision crafted from durable Titanium, available with full personalisation. Beautifully styled cufflinks, crafted in a square cushion shaped design. Offering a substantial feel each pair have been created from industrial strength Titanium and mirror polished for a classic yet modern look. Luxuriously styled cufflinks, crafted in a square cushion shaped design. We create each pair to order from a solid piece of Titanium, crafted into a durable beautifully finished cufflink, with a matte sheen. All cufflinks arrive in luxury packaging with presentation box.